Despite the different artistic movements over time, the structure of the interior of the St Waltrude Collegiate Church remained in keeping with gothic architecture. The interior showcases the same materials as the exterior. Bray sandstone, which gives the building a warm tinge, ranging from yellow to pink. This rock covers the walls from the choir to the nave, as well as the buttresses. Bluestone meets the bricks at the floor arches. Upon entering the Collegiate Church, one is instantly struck by a feeling of vertical momentum. This is due to the presence of tall, straight pillars and arches, which overhang the church choir. In addition, the alternation of the pillars and emptiness of the arches magnifies this feeling of verticality. The fleeting and changing light immerses us in a serene, yet exhilarating atmosphere. When walking around the entire Church, you move from one chapel to another, each decorated with an altar, a painting, a sculpture and a statue. These chapels are a testament to the projects of the Mons corporations and confraternities, devoted to the Virgin or saints. Some contain tomb stones, as certain families decided to bury their members in a chapel reserved for them. In some chapels, the gravestones are on the walls, in which case they are known as “taulets”. They embody the deceased, led by their patron saint to the Virgin and Child or to the Trinity. Until the 18th century, masses were held in these chapels, which served as small churches. Each year, more than one million masses were held in the Collegiate Church. Among others, the poor attended these masses to receive clothing or food, in exchange for which they expressed their deep gratitude to the canonesses. Jacques Du Broeucq, then-renowned Mons-born sculptor and architect, is the artist behind several works in the Church. Notably, he designed a rood screen, a true monumental structure, the vaults of which form a triple arch, under which there are three tondi, representing the three parts of the Trinity (nowadays, only the statues and bas-reliefs of this jube remain). In addition, seven statues, representing the seven Virtues, preside over the church choir. The northern arm of the transept contains the Resurrection, a life-size relief depicting Christ leaving the tomb. Other pieces enchant the church alongside Du Broeucq’s works. The famous Golden Chariot, brought out every year during the Doudou Procession, as well as the relics of St Waltrude. A white stone gothic sculpture of the saint, and another of Saint Michael bringing down the demon, also preside over the Collegiate Church. Looking up slightly, you will also see the oldest stained glass windows. 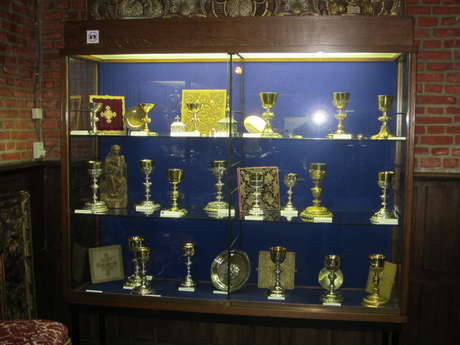 Not to mention the “treasure” itself, which contains a number of religious works of art, including one of the most prestigious sets of goldsmithery in Belgium (chalices, ciboria, monstrances, reliquaries, etc.). But also polychrome statues, paintings, ancient manuscripts, reminders of the chapter and a collection of shrouds that were wrapped around the relics of St Waltrude.